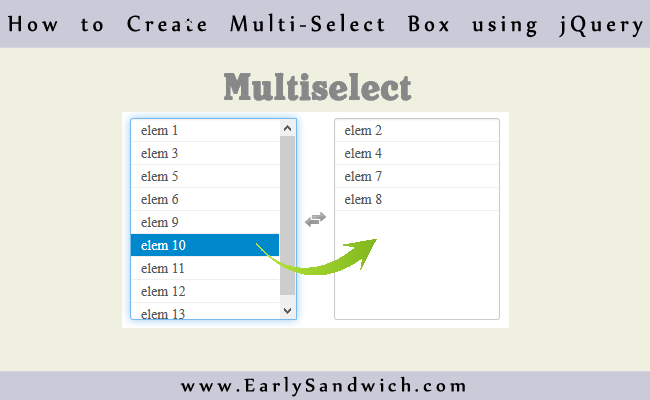 This tutorial will guide you about How to Select Multiple Items in Select Box Using jQuery. This jQuery plugin will help you to convert your simple HTML based Select Box into a stylish box in which your users will be able to select their desired items one by one and the items will move into selected items list. Further they can unselect any item by clicking an item from selected items list, and the selected items will be submitted when user submits the HTML Form. In above code, we are using an attribute multiple for telling the browser that this field is meant for selecting multiple items. Also we are using the attribute id=my-select. Our plugin will not work without assigning this id to our Select Box. You can further change this id to whatever you want. Another is the name attribute which will contain all selected items while Submitting Form. You can rename the value inside name attribute to whatever you want to use. You can see #my-select in above code. You can change it to whatever you want. But be sure that you use the same id here and in id attribute of your select box, otherwise this plugin will not work. You can see that we have added an attribute: selected to the items which we want to pre-select. So you can assign this attribute to whatever item you want to add in Pre-Selected List. You can see that you will need to add an attribute: disabled to any item you want to disable. Above code will be added in HTML of the select tag options. This code will also be added same like the previous option. You can customize the styling of classes assigned to headers and footers.